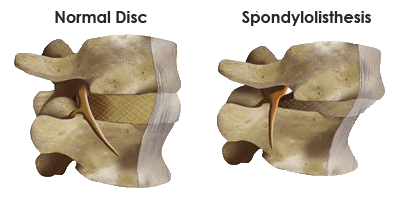 Spondylolisthesis is defined as a slip of one vertebral body relative to an adjacent vertebral body caused for the breakdown of the cartilage between the vertebra. This condition causes misalignment and narrowing of the spinal column, known as spinal stenosis, resulting on pressure on the nerves, thus causing pain in the buttocks or legs. This spinal condition most commonly presents as a degenerative disease in adults, but may be present in adolescents as a result of deformity or trauma. One of the most common symptoms of Spondylolisthesis is mild to moderate back pain. If the slip is compressing a nerve, leg pain often develops.